Thank you, Louisa, it’s good to know that I succeed in my purpose. Have a lovely day! There are too many versions of what actually happened, but I cannot disagree with you – his death was self-inflicted indeed. Lermontov provoked Martinov more that once so that he lost control and fired his pistol. Martinov was in shock of what he had done. It was not in his nature, and explains his silence regards the events. Thank you for reading them! Yes, in another account Lermontov looked at Martynov with utter contempt during the duel, and there is even a theory that Martynov didn’t kill Lermontov, but another person, because of the angle of the course that the bullet ran through his chest. I don’t think Martynov wanted to kill Lermontov either, and it’s good that they didn’t mention L’s intention not to shoot M, in that respect. Poor guy, having to live with killing Russia’s most promising writer! It was just another tragedy that could be avoided. Most definitely. Tolstoy’s quote makes you think. But I’m still glad that we did have Dostoevsky and Tolstoy! True 🙂 They wouldn’t be unnecessary ever. This is such an excellent retelling of the fatal duel… I much enjoyed the way you wrote it, dear Elisabeth! 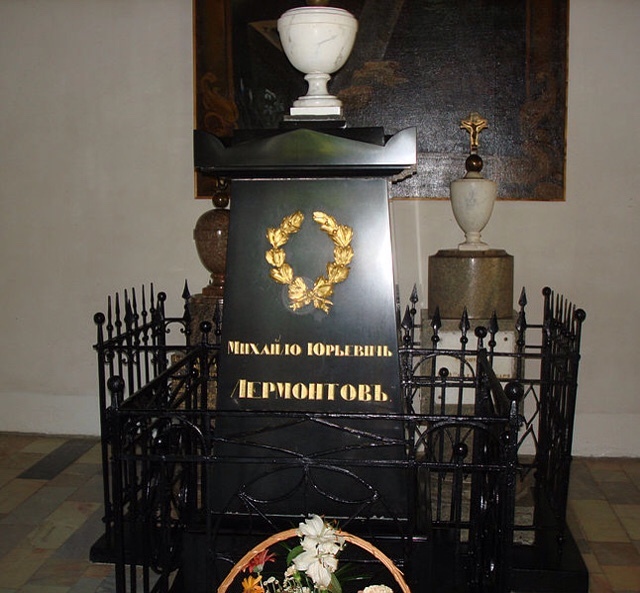 … It seems Martynov might have considered Lermontov´s words too harsh…. But a duel!?…. I guess we need to understand the importance it used to have when it came to Honor and Pride. Thank you so much, dear Amalia! Yes, it certainly seems like Martynov took too much offence. Although I’m sure even he thought it’d just be a warning, and that Lermontov would apologise. It was a different time, as you say. And for the record, Tolstoy met one of the seconds, Stolypin, about ten years after the duel, and he tried to get Stolypin to talk about the duel, but Stolypin refused to do so. This is a fascinating post, Elisabeth. Very well thought out and done. You obviously thought a lot about your conclusions. Your post gave me a feeling — a real feeling — for the first time of what a duel must have been like. So senseless from our twenty-first century perspective. 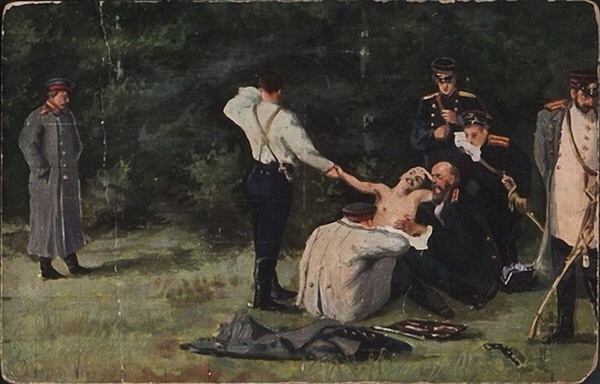 The painting of Lermontov dying which you posted (thanks!) conveys so much. 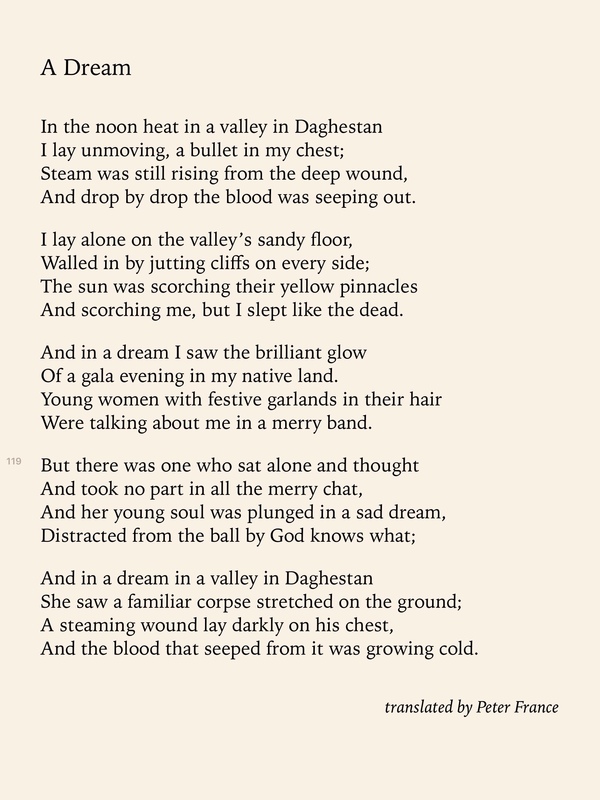 Lermontov’s prophetic poem “A Dream” is amazing in view of what happened. Uncanny. Thank you for mentioning the biography of Lermontov by Laurence Kelly. I had never heard of it. I have purchased it form Amazon. There was only one copy left for sale. I love random stories from history like this. And by the way, why do we not still practice the art of dueling? It would make some things so much easier to decide, right? Yes, me too! And yes, why don’t people duel anymore? It would be excellent for modern scoundrels like Weinstein! My goodness what a life that went to waste because of one bad decision. I never really understood how they could just demand a duel so easily when one could and would most probably be severely injured or worse killed. Literally playing with their own lives. You’re right though, he did (thinking it was honourable) when in hindsight it was foolish wasn’t it ? I’m not that in russian literature, but I’m fascinated how russian treat their writers like heroes. There are in deed still ‘popstars’ over there. My russian wife knows all books of Pushkin and others by heart! And I guess that all of the russians do. That makes me in a way a bit sad, because I missed to come closer to german or european literature. Two years ago I was in Pjatigorsk and visited Lermontovs house and I was overwhelmed by that spell of that place. As well as the cave Podval from Ill’s and Petrow’s novella ‘Twelve Chairs’. Hey Markus, so good to hear from you! I would love to go to Pyatigorsk and visit all those places! In Russia they definitely treat writers like pop stars. I was at the Helsinki book fair a few times, and they always have a Russian corner, that is really popular with the local Russians; they sit and talk about books the whole day. Two years ago Lyudmila Ulitskaya was there, she gave a lecture and people were practically fighting to get in to see her. 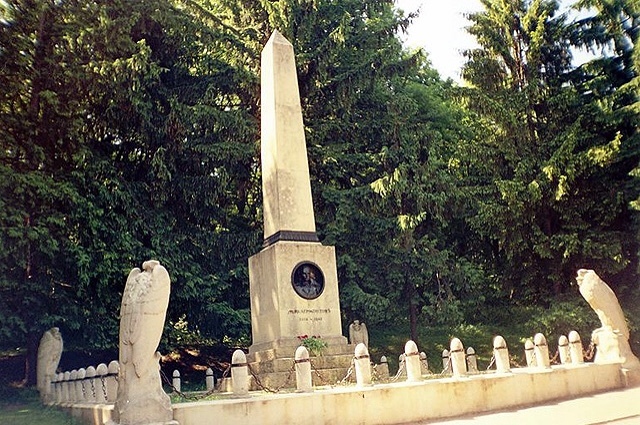 …this is the german wiki site where you can find the list of people buried there. And even in the small cities between St. Petersburg and Moscow you will find in almost all of them a Pushkin Museum, because all the writers stopped by small hotels on their travel between the two metropolises. Thank you for all your great advice, Markus! I really appreciate it, and it is something that I hope to do in the near future. I have never seen that movie, I shall look it up. I really enjoyed the photos you took at the Novodevichi Cemetery. With pleasure, Elisabeth. 🙂 …hopefully your blog will encourage me to read some more russian writers. My favorite is Bulgakov. Yes, go for that movie. Really with to see. so nice, to meet you here! Ah, Bulgakov, one of mine too, I’m actually re-reading The Master and Margarita now. He’s great. I’m sure you know many of those places in Moscow. I wonder how I could’ve missed the Russia House, it sounds just my thing! wow, Master and Margarita is great. I love it. I do remember pretty good how I felt inside this scenery of Moscows 20s. Later I went to all that places… ..Patrichats Pond, Malaja Bronnaja St., Sadovaja 302b (where Bugakov had is flat in real) and there was this spell again that I felt while reading. The ponds a wonderful and calm oasis in the center of Moscow. Did you know that Mick Jagger was inspired by this book, that he wrote the song ‘Sympathy for the devil’ for the Rolling Stones? Bulgarkov started writing M&M in 1928, then burned the script, wrote it again.. …and the book was censored and not published until the middle of the 1960s. Yes, I’ve watched the tv show on YouTube twice! I enjoyed it very much. The theme music keeps haunting your head for days! Last April there was an opera version of A Dog’s Heart here in Amsterdam, super interesting! I read about the Stones, and I’m not surprised that after reading the novel, they were inspired. It has the best quotes too, and so many literary references. Great stuff! yes, the music is great. A Dog’s Heart opera version, that’s sounds interesting. I didn’t know that this book so well known in Europe to stage an opera. I only know the book and the movie from the early 70s. Me neither, but it was sold out. It was really interesting. I was lucky to get tickets! I didn’t know there was a movie. There is one movie from 1976, the one I knew.. It was more a happening than an opera. Even my boyfriend enjoyed it 😄 Thank you for the links, I shall check them out. Like I said the 1988 version is even new for me… …looking forward to watch. oops… …I’ve found out, that the link which I considered as the 1988 version of Dog’s Heart is the 1976 version… …only in good quality. This quality is even better then the version we good already on DVD. Good morning, Markus. Thanks for letting me know. Hopefully we can watch it this weekend. So interesting to learn about this. Real-life literature. Yes, I agree, it’s definitely fascinating. Thanks for stopping by. How was the weekend with the Russians? so nice that you wrote. It says so in the description, but it wasn’t so. I speak ok-ish russian and my boyfriend a little bit, and we have both read the book. The quality was very good though. Yes, I know! Good that you enjoyed it 😄😄😄 Now you can rest a bit. My only exposure to Russian culture is through you, so thank you! Yes, I do, a little bit rusty though, I don’t speak it very often. I studied Russian, but didn’t finish it. So you go to Russia all the time! Is that how you met your wife? Wow, impressing. I’m envy you. 🙂 Cool. I appreciate that you have not only shared your passion for the literature but taken much care in making it palpable, real, interesting, intriguing by providing historical perspectives and most of all, human perspective. Who doesn’t want to know all the delicious details of an author’s life or the back stories of his/her characters! I commend this comment. It is very insightful. It points out what makes a such site such as this so interesting and readable and, by contrast, what many critics and academics fail to do. I’m so glad you’ve found my blog because now I have a source for learning a bit more about Russian literature. Your posts are beautiful! Great post. Russian culture is extremely rich in phenomena. However, I cannot perceive the writer in a translated poem. That’s not it. Maybe French were able to get Russian better, hence, all aristocrats and educated people of that time spoke French very well. There might be some good trans-creation. Thank you, Inese. Translating poetry is extremely difficult and I admire those who manage it well tremendously! Congratulations on the recent three-year anniversary, Elisabeth. This post is another fine example of why I followed you in the first place. I’ve made a promise to myself to dedicate more time to exploring blogs (there’s always so much to read), and I look forward to tucking into your posts from the past three years. Thank you for creating this page – it’s a real treat. Hello Shane, thank you! I agree, there is always a lot to read, and it’s not always easy to find a balance between reading other blogs, blog research and writing blogposts.